"No one has yet believed in God and the kingdom of God, no one has yet heard about the realm of the resurrected, and not been homesick from that hour, waiting and looking forward joyfully to being released from bodily existence. "Whether we are young or old makes no difference. What are twenty or thirty or fifty years in the sight of God? And which of us knows how near he or she may already be to the goal? That life only really begins when it ends here on earth, that all that is here is only the prologue before the curtain goes up – that is for young and old alike to think about. Why are we so afraid when we think about death? … Death is only dreadful for those who live in dread and fear of it. Death is not wild and terrible, if only we can be still and hold fast to God’s Word. Death is not bitter, if we have not become bitter ourselves. Death is grace, the greatest gift of grace that God gives to people who believe in him. Death is mild, death is sweet and gentle; it beckons to us with heavenly power, if only we realise that it is the gateway to our homeland, the tabernacle of joy, the everlasting kingdom of peace. "How do we know that dying is so dreadful? Who knows whether, in our human fear and anguish we are only shivering and shuddering at the most glorious, heavenly, blessed event in the world? 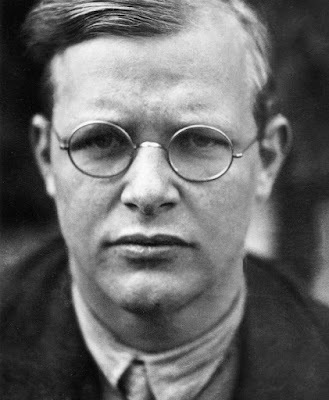 Quotes taken from Bonhoeffer: Pastor, Martyr, Prophet, Spy, by Eric Metaxas, Thomas Nelson, 2010.